Year in and year out, World Water Day is observed on March 22. It is not just consumers who are dependent on this precious commodity – agriculture and industry rely on it as well. A few facts and figures point out how valuable and sought-after water is throughout the world. World Water Day made its debut on March 22, 1993. The event can be traced back to a proposal by the UN Conference on Environment and Development in Rio de Janeiro. In 2016, the General Assembly of the United Nations underscored the value of drinking water once again by proclaiming the Water Action Decade. Over the ten years between 2018 and 2028, the global population’s understanding of water-related issues and pollution control is supposed to increase significantly. Governments and civil societies are called upon to adopt measures to manage water resources and consumption sustainably. Appropriately enough, the kickoff for the Water Action Decade was on World Water Day on March 22, 2018. At its facility in Cuautla, Mexico, Freudenberg-NOK Sealing Technologies has made the sustainable use of rainwater an important foundation of its operations. In 2016, several thousand square meters on the factory roof were converted into a rainwater collector. In just the first seven weeks after its construction, the system collected 526 cubic meters of water – a quantity that corresponds to the entire plant’s water consumption over six working days. The collector was expanded in 2017. That means the Cuautla facility is using less and less drinking water in its operations. The virtual water footprint is a way of showing how important drinking water is to industry. It indicates that the large industrial nations in particular have recently been using much more water than one would think at first glance. The virtual water footprint doesn’t merely calculate water consumption within the borders of a particular country. It also includes the quantities of water that are used to produce goods abroad if they are consumed or used domestically. For example, a PC accounts for 20,000 liters of water. The figure is 11,000 liters for a pair of jeans. Germans basically “import” more water from other countries than it uses domestically. 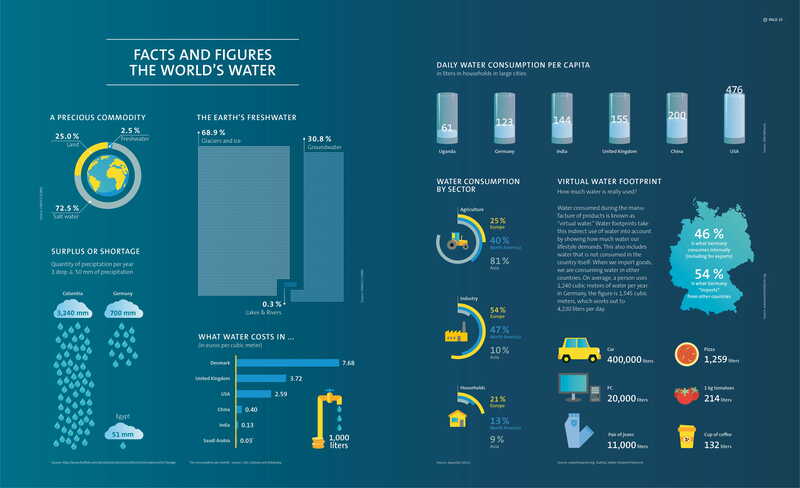 More information about global water issues can be found in the infographic.